Translatable – Picturish is fully translation ready. All you need to do is translate key – value pairs in a simple text file. Documentation – Picturish comes with in depth documentation that explains everything from installation to all the features. Ads – 7 integrated ad spots. All you need to do is paste your ad codes in admin area and picturish will do the rest. Analaytics – Google analytics are integrated right into admin area. 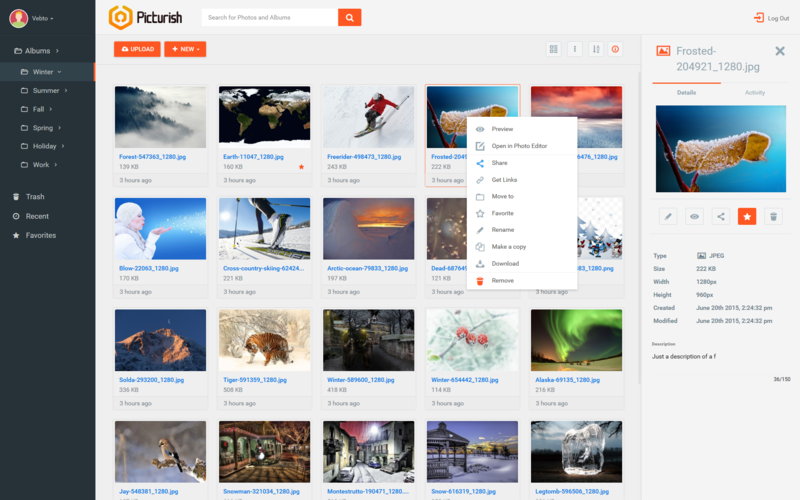 Photo Hosting – Easily create a photo hosting site with massive feature set or just use it as a self-hosted image editing and hosting application. 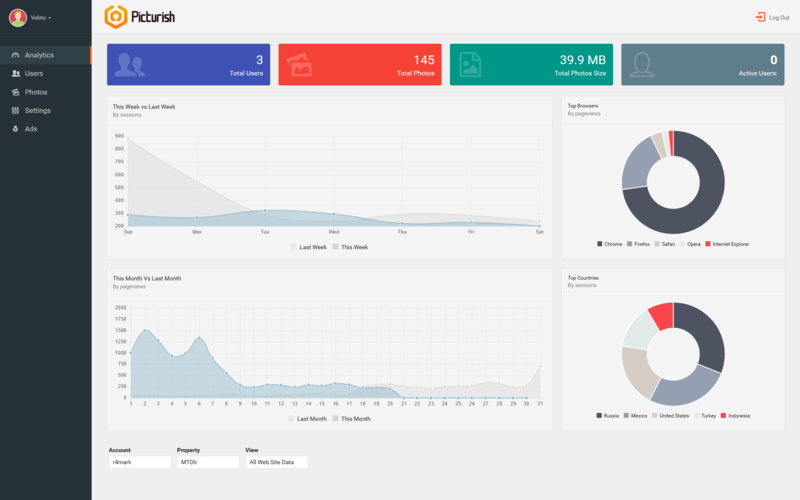 Dashboard – Advanced dashboard with feature set that rivals services such as google drive. Photo Editor – Powerful integrated photo editor allows the creation of new photos or easy editing of already uploaded photos. Admin Area – Picturish comes with fully-featured admin area, that allows you to manage your users, photos, ads and many settings such as maximum allowed disk space for each user. Sharing – Uploaded photos can be shared easily to all the most popular social services. Links – Each uploaded photo has direct, preview, embed, forum and more links generated for any use case. - Fixed several issues with admin area access. 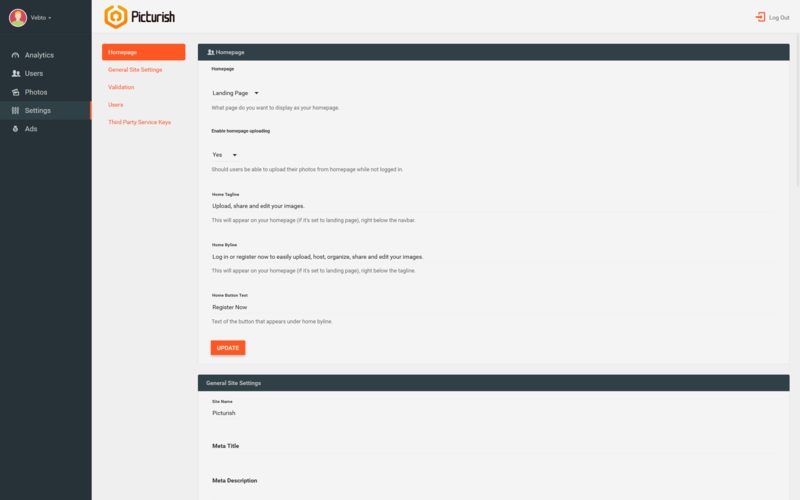 - Fixed some issues with responsiveness in admin area. - Fixed several issues that occurred when using https. - Fixed a rare issue that prevented folder creation on some servers. - Fixed a rare issue that prevented viewing created folders on some servers. - Fixed an issue with facebook social login sometimes not working. - Fixed an issue with admin not being able to create users if registration is disabled. - Fixed an issue with image copy functionality sometimes not working. - Fixed an issue with image not being shown when sharing via social sites. 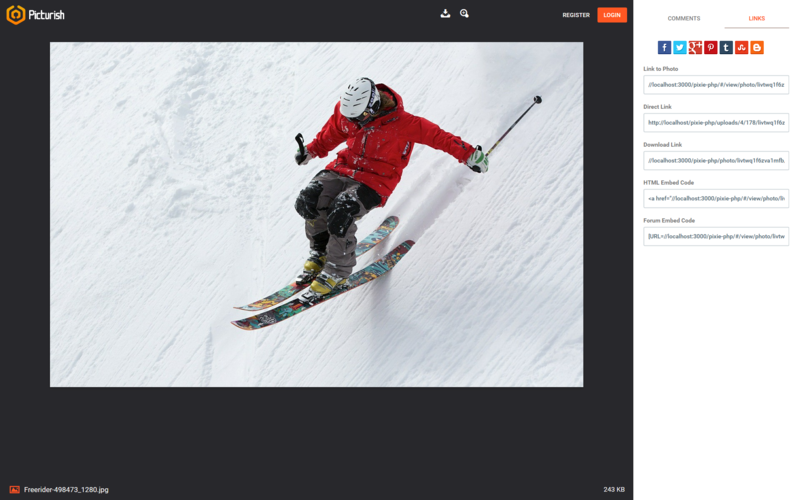 - Fixed an issue with photos created via editor not having extension when downloading. - Fixed an issue with password reset that occurred when using mailgun or mandrill. - Fixed several issues with installer that would occur with various edge server configurations and restrictions. - Added new site url option in settings page, should always be set to current site url. - You can now update your mail settings directly from admin area settings page. - All sensitive settings will now be properly hidden from page source if not logged in as admin. - Fixed an issue where the same ad would be displayed in different slots on photo preview page. - Fixed an issue where photos and folders would sometimes not get deleted from trash properly. - Fixed an issue with html embed code not getting generated properly sometimes. - Fixed an issue where password change would not work properly. - Fixed an issue where uploading from homepage would not work if user was logged in. - Fixed an issue with some of the admin tables not working properly on Safari when using Mac or iOS. - Fixed an issue with settings not always saving properly from settings page. - Fixed an issue where some service keys were shown in plain text when viewing page source. - Service keys will now be hidden by default in admin area settings page. - Fixed an issue with password only being removable from images after page refresh. - Fixed an issue with .gif images not uploading properly sometimes. - Fixed some display issues with tables in admin area. - It's now possible to upload multiple files by selecting them while holding down ctrl key. - Fixed several issues with registration disabling. - Fixed an issue with facebook login sometimes not working. - Corrected several visual issues if screen height was too small. - Fixed an issue where logging out and in without a page refresh would cause problems. - Fixed an issue with ads being limited to 150 characters. - Fixed an issue with editor tabs sometimes not working. - Fixed an issue with google fonts not working if using https. - Several fixes to photo editor. - Fixed an issue with activity tab showing activity for wrong user sometimes. - Fixed an issue with incorrect 'time ago' being shown under images. - Fixed an issue with some users not being able to change their avatar. - Fixed an issue with google analytics code not being outputted properly. - Fixed an issue with password protected photos accepting any password. - Gifs will not become static anymore after uploading. - Fixed an issue with user profile not showing on image preview page.